If your favourite indoor plant looks a little under the weather, don’t give up on it just yet. We look at the most common houseplant problems and their solutions. 1. Why are my plant’s roots turning black and rotting? Possible cause: Overwatering. Excess water and poor drainage can do plenty of damage to your indoor plants. Aerate the soil by poking holes into the soil using a skewer. Repot your plant into fresh potting soil with drainage holes and feed it with Nitrosol. Find out how often your specific plant should be watered, and stick to these guidelines. 2. Why won’t my plant grow? Possible cause: This could be due to your growing plant becoming too big for its current pot. Solution: This can easily be solved by repotting the plant into a pot that is about 5cm larger in diameter than the current pot. Solution: In order to grow and reproduce efficiently, plants require the right amount of nutrients. Feed your houseplants with an all-purpose plant food that contains macro and micro-elements, such as Seagro. 3. Why are my plant’s leaves sticky, misshapen and turning yellow? Possible cause: Red spider mites. These tiny but vicious spiders are hard to see but easily identified by the little droplets of water they leave trapped in near-invisible webs on the underside of the leaf after watering. Spray canola oil or red spider mite spray on the underside of leaves. Spider mites hate cold water, so deter them by spraying your plant twice a day with cold water, ensuring it hits the undersides of the leaves and any other hiding places. 4. Why do my plants have brown and brittle tips? Possible cause: If you spot dead, brown tissue at the tips of the leaves, this could mean that the environment is too dry for the plant. 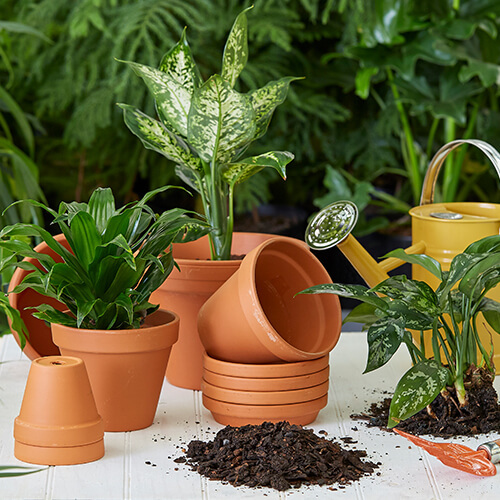 Place your pot plants on top of a shallow tray filled with pebbles and water; when the water evaporates, it will help to create humidity for the plants. Mist the leaves with a gentle spray regularly. Move your plant to a part of the house with high humidity, such as the bathroom. 5. What is causing powdery, fungal growth on my plant’s leaves? Possible cause: Powdery mildew (a plant disease). If your plants are in an environment with high humidity and poor air circulation, it can become a breeding ground for disease. Nurse them back to health by picking off the infected leaves and improving the air circulation around your plants, such as placing them near open windows. Place plants in a well-ventilated room to maintain health. Alternative cause: Mealybug. These common pests look like pieces of cotton stuck to the leaves of your indoor plants. Solution: Treat your plant by wiping the leaves with a damp cloth to remove the waxy coating of mealybugs, then spray thoroughly with Efekto Malasol or a homemade pest repellent made of garlic, cooking oil and dishwashing liquid blended with water. 6. Why are my plant’s leaves drooping? Consult and follow the plant’s label and care guide as different houseplants vary in their light requirements. Move the plant to a different spot with better light, such as a windowsill. Rotate your plants often to avoid lopsided growth, and remove any barriers to light reaching your plants, such as blinds and sheer curtains. If you have limited light coming in your home, grow indoor plants that are better suited to low or medium light, such as peace lilies and ferns.